Today I am sharing a few pictures + details from my three bridal showers and also my bachelorette party! Goodness, in some ways these events seem like they happened yesterday, and in other ways, it seems like a lifetime has happened since then! September + October were full of my brothers' weddings, company, harvest, touring with my family, spending weekends in Kansas working on our new house, and little bits of wedding planning, amongst many many other things. 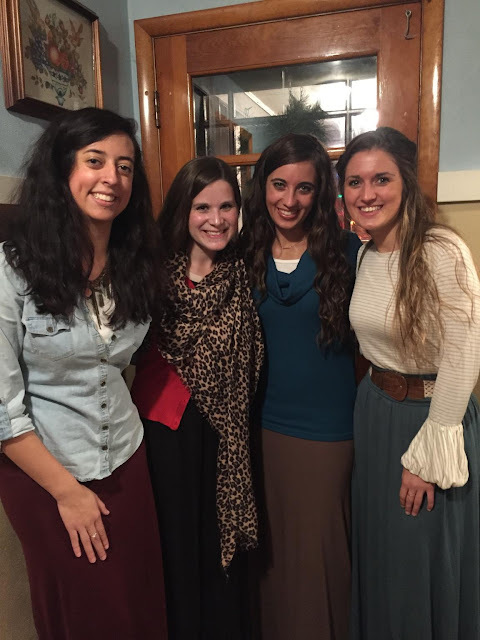 It ended up that the timing for my bridal showers was having all three within a week and a half of each other! They were each very unique and extremely special times for me. 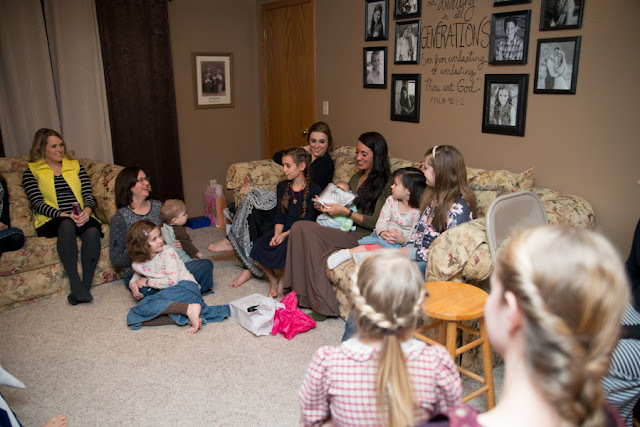 I have hosted numerous bridal showers for friends + cousins over the past seven years, and so having my own bridal showers hosted for me seemed very strange! It was quite different not to be in the middle of the planning + preparing, but was very special and sweet. The first shower was in Kansas and was hosted by John's mother + sisters. It was very special to be able to have this time to meet a number of "Leavenworth friends" and to also spend time with my new family-to-be. 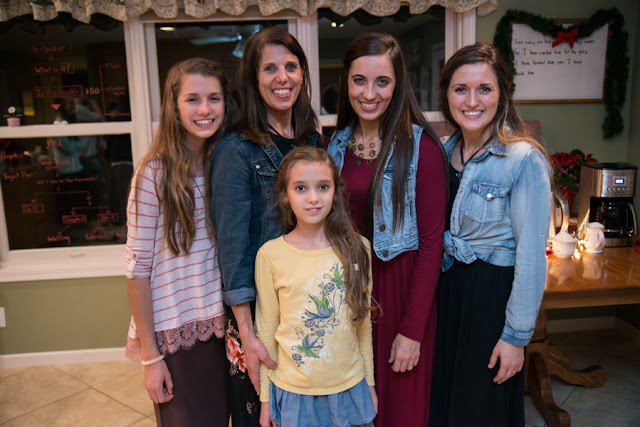 I also loved having my mom + sisters come down with me. 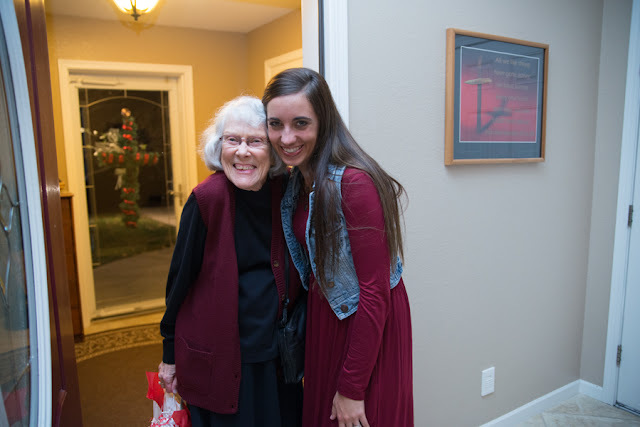 Gigi shared a devotional at my shower and I loved that example of an older woman passing down wisdom to me. This shower was a pantry themed shower. Every guest was asked to bring a spice and/or items for my new pantry. I had never heard of this kind of shower before but now I can't wait to host a shower for someone else sometime because I know I have to use this idea! It is brilliant and has been the biggest blessing for me as a new bride! As a result of this shower, I had a very well stocked pantry from the very beginning, with literally all of the spices I needed and an abundance of canned things and baking supplies. It was a huge blessing to be able to start out with so many of the kitchen staples needed to run a kitchen. 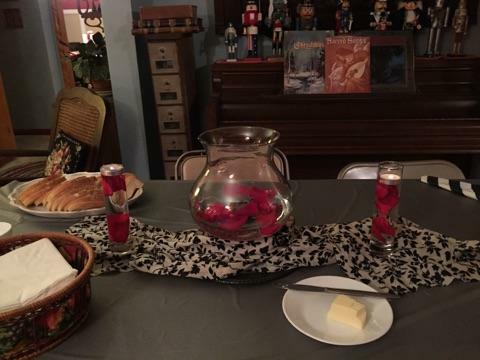 My new sisters did a lovely job with decor + food! The next week found shower #2 happening in Iowa. This was hosted my two of my very dear Iowa gals, who were also my reception coordinators at my wedding. 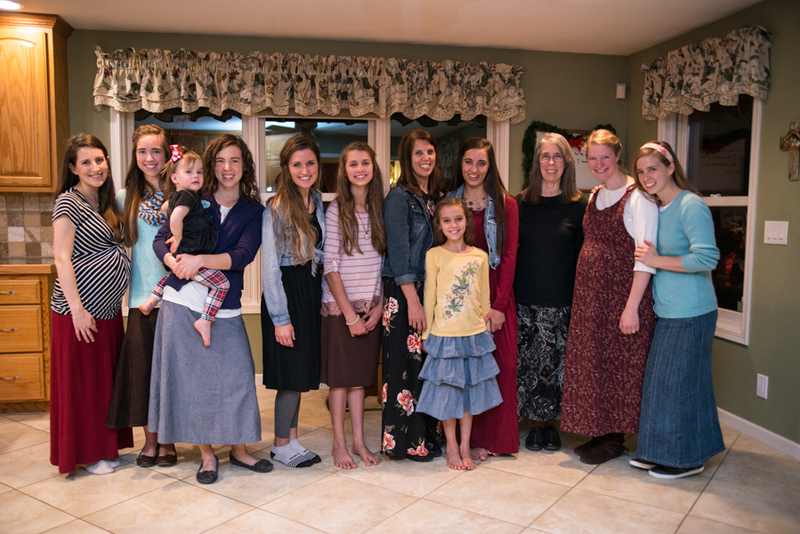 They invited a number of old friends that I knew through either homeschooling events/groups or through traveling with Bright Lights Ministries years ago. They had a soup + artisan bread bar and had various girls make different kinds of soups. 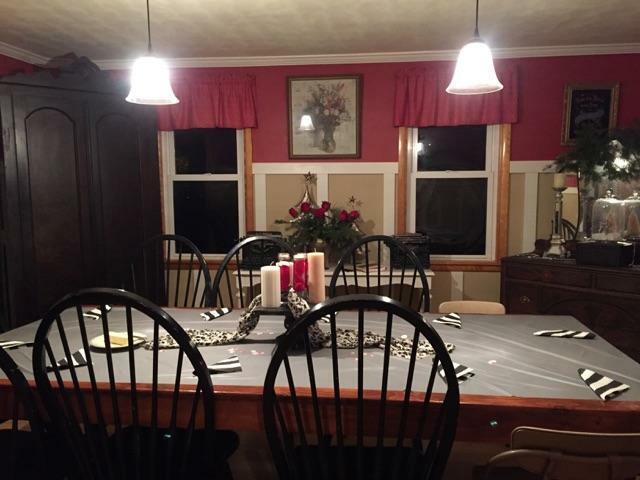 Everything was decorated with roses, candles, and classy black + red. 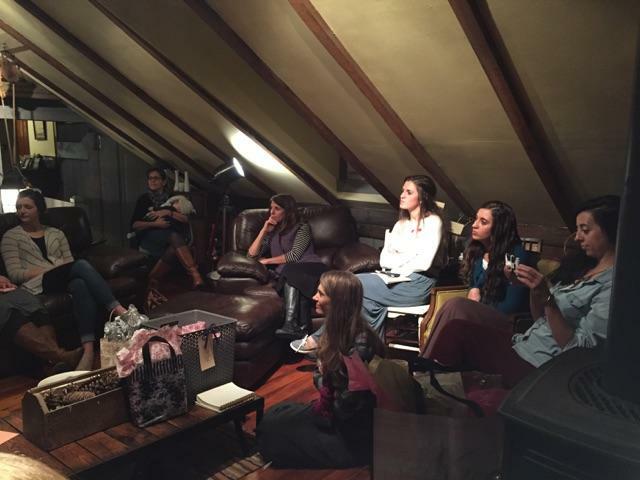 After eating, we moved up to the cozy + vintage renovated attic, where one of the ladies shared a beautiful devotional on the life of Sarah, Abraham's wife. These gals. Love them so! They pulled off this shower without a hitch and they are just some of the sweetest girls you will ever meet. We have done more road trips, drank more coffee, shopped more thrift stores, done more photo shoots, worked more conferences, read more Doves messages, eaten more Ritz Sour Cream and Onion Pita Chips,and quoted more Jane Austen to each other....than should be legal! My aunts made some delicious cheesecakes to go with everyone's coffee drinks. So yummy! So thankful for these two ladies! I am blessed with the best when it comes to my parents' extended families, and it was super special to have these aunts host the shower for me! And then there was my bachelorette party. It was a beautiful night and I will never forget it! 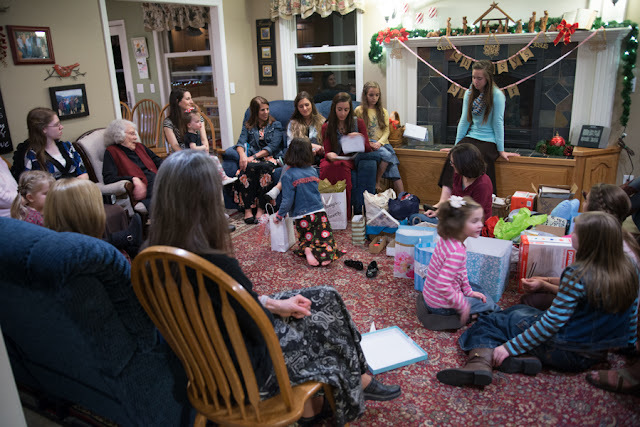 She asked me who I wanted at the party and I decided on the fourteen bridesmaids, my two personal attendants, my mom and new mom-to-be, and all the little flower girls. It was a full house that Thursday night! 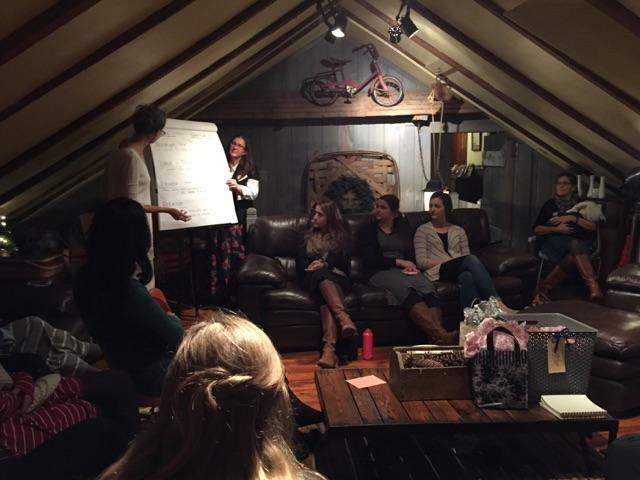 All the guys were out at the bachelor party for John, so it was "girl zone" in our house! 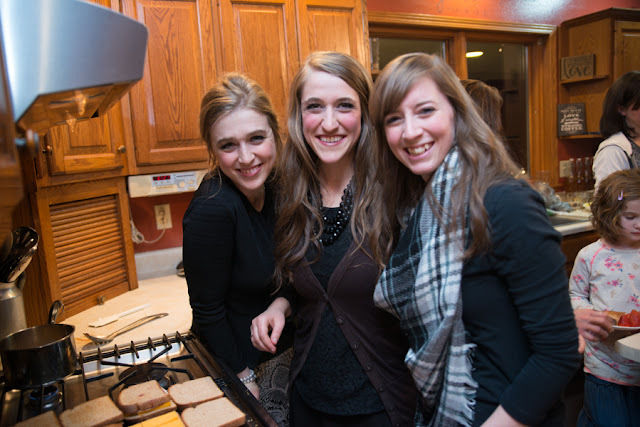 These three new sistas of mine helped Allison with the cooking for the party! 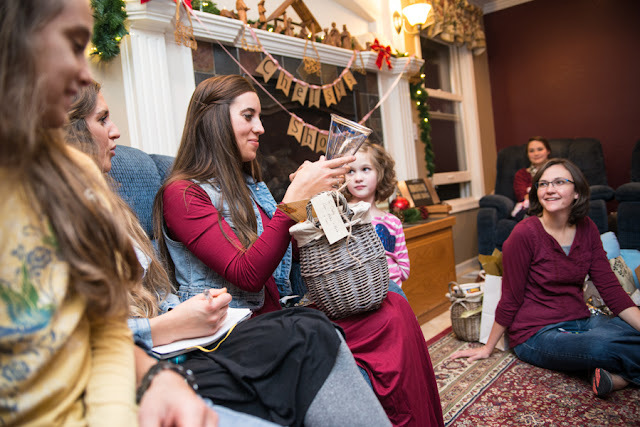 They are some of the most amazing women I know and I'm literally tearing up right now just marveling in God's goodness in bringing such absolute jewels as these girls as additions to the Bontrager tribe. 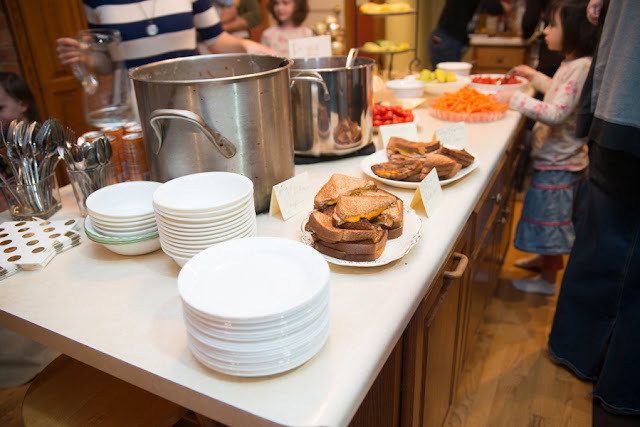 Spring Chicken Soup, Tomato Cream Soup, and raspberry turkey grilled cheese sandwiches. (don't judge until you've tried them-we were first introduced to the concept at a gourmet restaurant years ago, and they have been a favorite of mine ever since!) There was also an abundance of veggies, with fresh fruits for dessert, and Izzies to add some pizzaz to the menu. Unbeknownst to me, Allison asked all of the bridesmaids to bring a special snack or fun item for John's and my honeymoon trip. 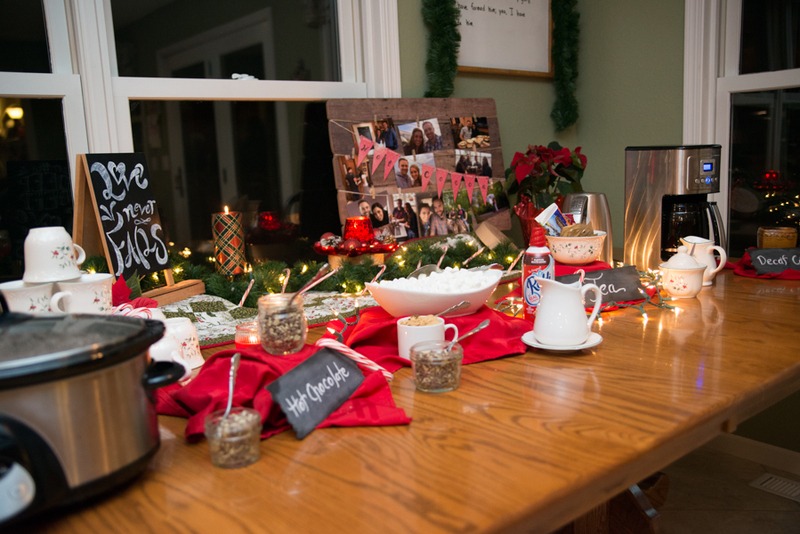 It was the sweetest idea and John + I loved having those treats on our honeymoon later! There was everything from chips/salsa to a fun chocolate tasting game to massage oils to everything in-between. This girl. She worked so hard for the bachelorette party and my wedding. I don't know what I would have done without her. She literally was the driving force that made everything happen. She faithfully planned, helped, and alternately took over tasks, throughout the few months leading up to the wedding, and specifically through the month of December. I could not have had the wedding day that I had without her, and I am so grateful! My "Last Week as a Bontrager" post is up next, and then it's on to the WEDDING PICTURES!! Anyone else excited for that?! I've helped with planning so many parties... it's certainly fun! I love the pantry idea, too! The raspberry turkey grilled cheese sandwiches sound like they would be good! Aww. Thanks so much for sharing. Can't wait to see more! Lovely pictures, so excited for the wedding photos! Yay! I can't wait to see wedding pictures & everything else!! 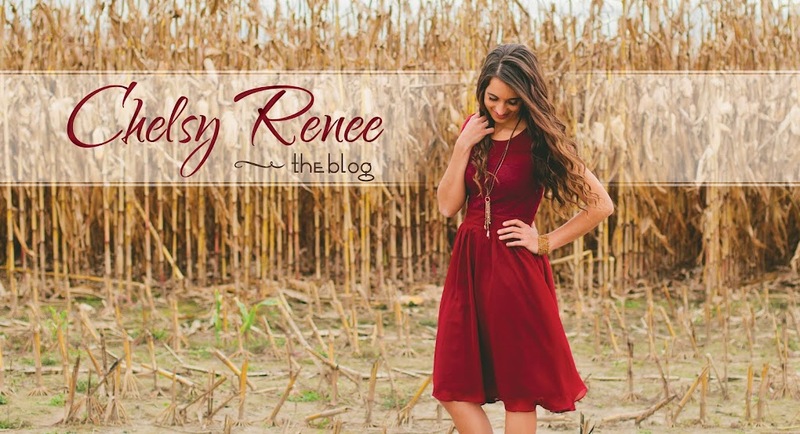 Loved this post so much, Chelsy! I can't wait for the ones to follow...especially wedding pictures and your & John's love story. When I got married years and years ago, our church choir gave us a shower and the theme was pantry as well, except the cans had their labels removed. So it was exciting to see what we'd have for dinner when we'd open a surprise can. Fed us well when we were setting up our life. Your showers looked wonderful and spirit filled. Thanks for sharing. Oh my! Opening those surprises must have been interesting and neat, haha! Thanks so much for sharing!! Looks like so much fun and love extended!! Can’t wait to read about you and John’s love story!!!!! Thanks so much for the update! I am extremely excited for John❤Your love story. I really love your updates but, I understand how busy life can get so I understand if blogging gets pushed to the back burner. Anyways, this looks like such an exciting season in your life and I appreciate when you do jump on here and give an update. Sounds like you and John were showered with love in three really special ways! I've never heard of a pantry shower - but I love the idea! I remember going out and having to stock up on spices and basics right after we got married! Always enjoy reading you blog/posts. Thanks for posting. Looking forward to more posts! Chelsy, please tell us about the picture of you and John in Alaska. It looked like he was bumming a ride, off to the side of the road and surprised ya?! Can't wait to read your ❤️ story!!! Yes, I will, sometime! The long + short of it is that it was THEEEE best surprise ever. John surprised me so many different times when we were dating and each time seemed to be even better than the last! He is SO GOOD at surprises! That is so great. I didn't know him until the wedding and didn't get to talk much to him but what I did I was impressed with him and think he is a great man. Bridal showers are SOOO fun. When my sister had hers it was soo much fun just like yours looked!